Contained within a book of poetry “The Poet’s Choice” (published 1962) that I recently bought at a used book sale, is a poem by Jamaican poet, Louis Simpson (1923 – 2012) entitled “Walt Whitman at Bear Mountain.” Mr. Simpson came to the U.S. when he was 17 to attend college and remained here, eventually teaching at University of California, Berkeley and SUNY at Stony Brook. He was very interested in understanding America, his adopted country, and his poems at times reflect an investigation into the myths that he believed this country tells itself. Where it is folded like cloth. And he seems friendly. The Open Road goes to the used-parking lot. “Where is the nation you promised? And the light above the street is sick to death. “As for the people – see how they neglect you! “I am here,” he answered. “It seems you have found me out. I advertised? Were my words not sufficiently plain? Then, vastly amused—“Why do reproach me? I freely confess I am wholly disreputable. A crocodile in wrinkled metal loafing . . .
And the earth, are relieved. Blossoming from the stones that are not there . . . The clouds are lifting from the high Sierras. Dances like Italy, imagining red. Me, wherever my life is to be lived, O to be self-balanced for contigencies! as the trees and animals do. I decided to try and make a random choice of this year’s “Poem in My Pocket” selection by going to the web page http://www.poets.org/page.php/prmID/409 (where all the sample poems are arranged by topic) and closing my eyes and choosing. Turns out I landed on another Walt Whitman poem! 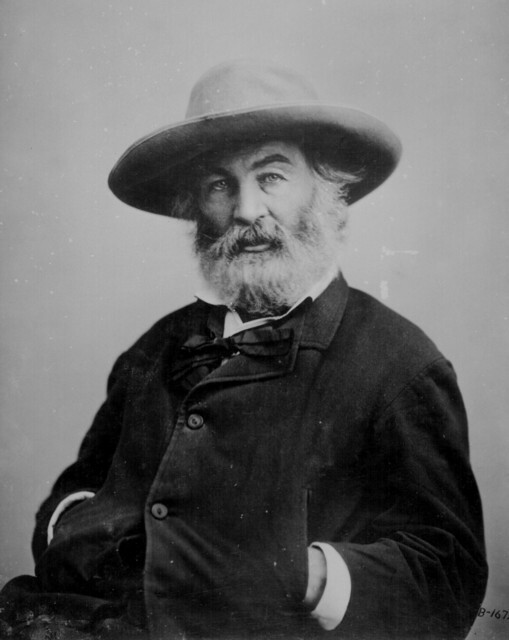 Turns out Whitman has four of his poems among the 61 samples (more than any of the other poets whose poems are provided). 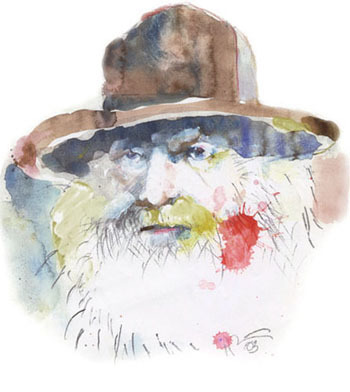 A man ahead of his time I began to appreciate Walt Whitman in the past 10 years or so. He seems to embody the vagabond spirit of the wandering poet at the same time realizing that he, himself, was standing at the precipice of a very changing world. He recognized somehow that the emerging industrial age that he lived in would eventually change the course of the world as it had been known and what had been mostly farm and agrarian life. He wrote about himself, the “I” and the “me” in a boisterous manner as if to somehow reclaim man’s solitary identity in the midst what was to be eventually the modern machine age (that we continue to live in today). Whitman was perhaps the last of the Romantics, however I’m not sure he’s classifed anywhere that way. Here is his poem I’ll print and carry with me today, “Poem in My Pocket” day. National Poetry Month — Who’s on First? 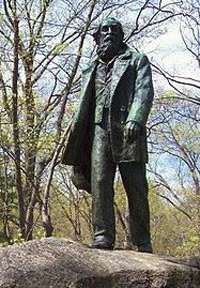 An American poet who was born on Long Island, New York in 1819 and died in Camden, NJ in 1892. Whitman is an American original, and in my humble opinion, a man ahead of his time. I didn’t appreciate him until recent years.